Elbow Cay is home to five public beaches made up of beautiful white sand and crystal waters. While at the beach, be sure to bring along your snorkeling gear to gaze at all the amazing sea life. Ask our Firefly Sunset Resort concierge to point you in the direction of the closest beach and they will be happy to oblige. Also ask about our special concierge services when it comes to packing a picnic for your beach adventures. Elbow Cay Beach– Located near the heart of the island of Elbow Cay, this beach is on the South East edge of the island. Empty of large resorts and only peppered with private residences Elbow Cay beach is perfect for long walks or tranquil afternoons. Nathan’s Bay Beach– Located near the Hope Town Lighthouse, Nathan’s Bay Beach is a small sanded beach with exceptionally clear water. Not ideal for beach activities since there isn’t much room to ‘play’ it is a great place for a swim or a cautious nap (the tides can sneak up on you!). Town Beach is the name of the beach that runs from the St. James Methodist church in Hope Town to the North end of Elbow Cay. It is a wonderful crescent beach with easy access to off shore live reef. It is also an easy access through many dune Passovers throughout the village of Hope Town if you are renting outside the village area. The beach is pinky white with soft sand. The Abaco sand is so different as it doesn’t stick to you. Because of the reef formation just offshore, we don’t get the horrible undertow that plagues many of the Florida Beaches. Hope Town Beach located towards the center of Hope Town is filled with soft white sand and beautiful waters. Offering a great location for those who want to be close to local amenities, as well as an onsite bar and grille open until 7 p.m.
Tahiti Beach juts out into the sea of Abaco from the southernmost tip of Elbow Cay as the island separates from Tilloo Cay. The beach is protected in most winds and is just down the shore from Firefly Sunset Resort. Towering coconuts trees shadow most of the white sand beach – it reminded early settlers of Tahiti and the nickname stuck. Tahiti Beach begins as a cove with a shallow crescent beach that juts out into a sand bar perfect for the whole family. This beach is fully accessible by boat, foot, golf cart, or bike. Low tide is particularly fun at Tahiti Beach as the sand bar seems to go on forever and the children are free to explore and snorkel with much freedom while mom and dad enjoy the shade and a good book. The area is quite protected. Want to know more about the spectacular beaches and parks around Hope Town? 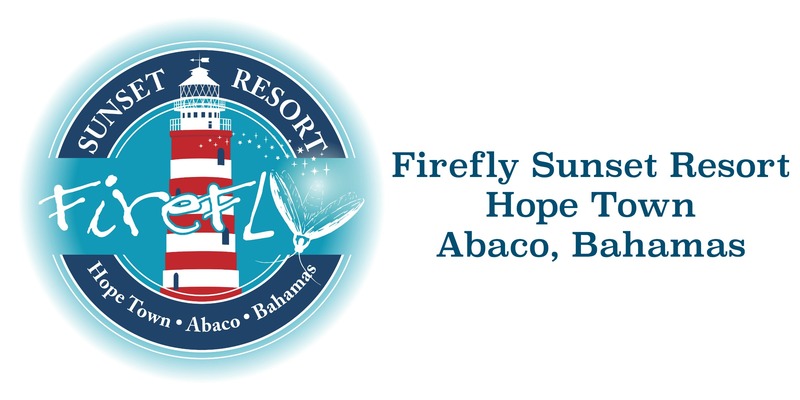 Our Firefly Sunset Resort concierge can always assist you.